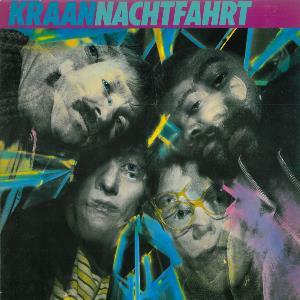 1982's Nachtfahrt ("Night Drive") was Kraan's first major step into their 80s sound. Their core style turned out to be a good fit for 80s technology and popular musical modes - on their albums from this period, they were able to both develop and improve their basic style, as well as experiment with new styles with a confident flair and good taste. This album is a well rounded one, with lots of different flavors to keep things interesting. One of Kraan's calling cards, the jazzy bass-driven instrumental, is well represented here with three of the album's best tracks: the strong opening number "Wintruper Echo", propelled into the atmosphere by an irresistible echoplexed trebly bass riff, a fast tempo, and heavenly guitars; the jazz/fusion "Nachtfahrt", one of the album's few "repeats" of their late 70s sound employed on albums like Flyday; and the closing "Luna Park", a slower, more atmospheric instrumental that seems to combine the virtues of the two others into a feel-good nightcap. The album's more experimental side is the one that gets the most grief from fans, but I think they work very well. "Faust 2000", the second track, sounds like some 80s pop tune I can't quite place, and it's in-your-face with pounding electronic drums, minimalistic half-shouted vocals, and a robotic, monotonous feel that's the antithesis of everything we usually think of bands like Kraan. But it's good! Jarring, perhaps, but bold and undeniably catchy. The title seems to acknowledge that this could be a pastiche of some imagined future for their fellow countrymen Faust - little did they know they would live to see this future! The other experimental track, "Viel Zu Heis", is another winner, this time exploring the realm of "dub" - an offshoot of reggae wherein the main performance is done at the mixing desk, remixing and adding effects to instruments in what would otherwise be a basic studio reggae jam. It's a strange one, but by golly it works. The crowning jewel of this album is quite possibly the third track, "Elfenbein", a sophisticated and multi-layered song that features several contrasting melodies, moods, and shadings in the arrangement - almost a mini-epic at just five minutes long. Beautiful vocals, too, and very unlike any other Kraan track I've heard. I bet they spent a long time working on this one, it shows, and it pays off. A more guilty pleasure can be had in the unapologetic hard rock of the self-referential "Playing for You". Loud power chords, thundering drums, and a lyric that just expresses the joy of what they're doing, it's infectious and totally catchy. Love this track. The remaining two tracks are unfortunately mediocre, to put it kindly. "Normal" and "Paper Stars" are very basic, uninteresting pop rockers - the former shows some promise with the main bass riff, but it fails to do much else for the rest of the song; even the lyric mainly repeats the phrase "Ich bin normal" in a voice that sounds like it can't wait to move on to the next song. "Paper Stars" is a bit more lively, but its melody is fairly trivial and uninteresting as well - when your only memorable element is a boring vocal hook ("way-ohhh!" in the chorus), the song has little chance of holding my interest. Overall I'll give this a strong 3 - if you skip tracks 7 and 8, it might be worth a 4. If you despise 80s production, keep it at a 3. But even if you do, there's enough "classic" sound here to warrant a listen - if only to the three instrumentals plus "Elfenbein".